Wish Token reads: wish token, good for one wish. 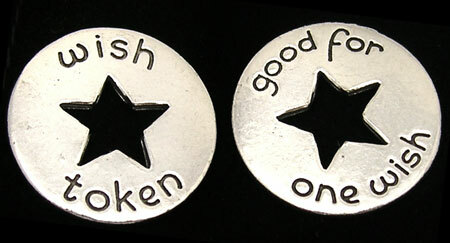 Pocket tokens are made of lead free pewter and are about 1 inch in diameter. QUANTITY DISCOUNTS: Buy 100+ of any of the eligible Pocket Pieces (found in Pocket Token Gallery > Pocket Pieces) and the price drops to $1.55/each (You may mix and match styles).